In 1975, with a passionate commitment to the emerging work of feminist writers, Barbara Deming founded The Money for Women Fund with a few thousand dollars she was able to put aside from her monthly income. In 1977, she wrote in a letter: “Our capital is still very small. . . only about $18,000, which I received from an insurance company after I was hurt in an auto accident. But I also add to the Fund’s account as much money as I am able to save—several thousand dollars each year.” After her death in 1984, Money for Women, one of the major beneficiaries of her estate, was renamed Money for Women/Barbara Deming Memorial Fund. Without Barbara Deming’s generosity and commitment to supporting the work of feminist artists with every dollar she could spare, The Fund would not exist. 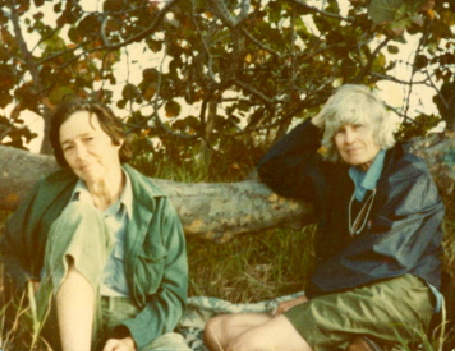 Mary Meigs moved to Cape Cod with Barbara Deming, whom she met in 1954. They joined an artistic circle that included abstract painter Mark Rothko, critic Edmund Wilson, and writer Mary McCarthy. In 1963 Wilson introduced Meigs to Marie-Claire Blais, a writer from Quebec who became romantically involved with Meigs and Deming. Meigs and Blais moved to Brittany and then both returned to Montreal in 1976, where Meigs spent the remainder of her life. Although she did not “found” the fund, she has been a longtime financial supporter. At her death in 2002, Meigs left the fund an annuity, which continues until 2017. Deadline for applications is January 31st each year. Fiction and Art in even years, Non-Fiction and Poetry in odd years.